Caught my attention for love of diagramming. Stayed for the relationship between spatial & relational mapping, plus effective 80-20-esque impacts to search. In the representations we call diagrammatic, information is organized by location, and often much of the information needed to make an inference is present and explicit at a single location. In addition, cues to the next logical step in the problem may be present at an adjacent location. Therefore problem solving can proceed through a smooth traversal of the diagram, and may require very little search or computation of elements that had been implicit. The advantages of diagrams, in our view, are computational. That is diagrams can be better representations not because they contain more information, but because the indexing of this information can support extremely useful and efficient computational processes. But this means that diagrams are useful only to those who know the appropriate computational processes for taking advantage of them. The program operating on the data structure employs the following kinds of processes: (1) Search operates on the node-link data structures, seeking to locate sets of elements that satisfy the conditions of one or more productions. This process requires attention management. (2) Recognition matches the condition elements of a production to data ele- ments located through search. Recognition depends on a match between the elements in the data structure and the conditions of the productions in the program. (3) Inference executes the associated action to add new (inferred) elements to the data structure. How do sentential and diagrammatic representations, respectively, affect the three components of information processing mentioned above: search, recognition, and inference? 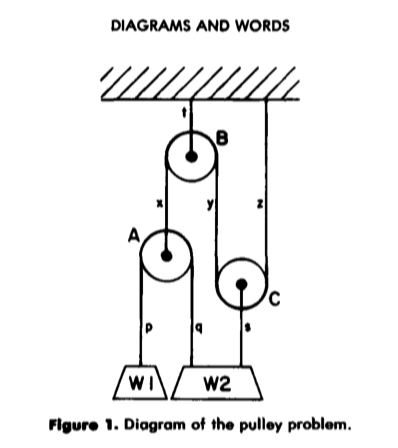 Diagrams can group together all information that is used together, thus avoiding large amounts of search for the elements needed to make a problem-solving inference. Diagrams typically use location to group information about a single ele- ment, avoiding the need to match symbolic labels. Diagrams automatically support a large number of perceptual inferences, which are extremely easy for humans.